One exception I can think of to “Never buy or sell an individual security. The person on the other side of the table knows more than you do about this stuff” is ESPP plans through work. The 15% discount on the stock being bought (at the price of not having access to the money for the 3 month period) is a guaranteed gain. As long as you are very careful about how much you buy. The trouble with buying employer stock is that it is almost negative diversification, as many Enron employees learned very painfully. A serious downturn in one’s employer’s business is one of the biggest financial risks many workers face. Holding employer stock magnifies the risk. There may be some offsetting return – a discount – but great caution is still called for. The risk is minimal — close to non-existent — if one sells immediately. The number of companies large enough to offer an ESPP that go completely bankrupt in a given 3-month or 6-month period is close to zero, and even in some of those cases, employees might be able to recoup the principal on their ESPP contributions. I can’t think of any investment, other than a government-secured short-term money market fund, that has less risk that that. (eventually) get the money back if the company crashed before the stock purchase. and health insurance”, “keep yourself healthy enough to work”, and “don’t divorce”. The risk is minimal â€” close to non-existent â€” if one sells immediately. No doubt. If one sells immediately. But I wonder what employees in these programs actually do. Well, if it’s IBM or some other boring blue-chip company that’s older than God, buying their stock at a heavy discount (and holding it) is probably a reasonable risk. After all, those plans don’t let you buy TOO much stock, as a function of your salary. As for buying at a 15% discount and then selling immediately at par, there are significant tax liabilities for selling in less than two years, which would put a major dent in the ROI. Those “significant tax liabilities” are the short-term capital gains rate. 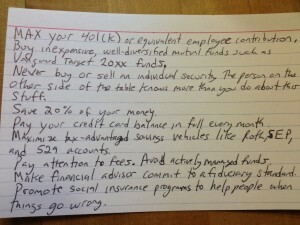 And yes, you should max out your 401(k) contributions and your Roth IRA, if possible, first. But if your company offers an ESPP plan, it is simply absurd not to contribute because your 15% (or more, if the stock goes up in the vesting period) will be taxed. What, precisely, is the alternative? Is there any investment which guarantees a minimum gain of 15% (before short-term capital gains taxes)? Or a smaller, tax-free gain which ends up being greater than 15% minus short-term capital gains taxes? Please let me know, because I will immediately transfer most of my savings into it. Well, “minimum gain of 15% (before short-term capital gains taxes)” is a little bit like saying “healthy except for the broken leg.” True, but with significant implications. But it’s not just capital gains taxes. The other end of this is that 15% is a VERY, VERY generous discount for any stock option that doesn’t have a long vesting period. I’ve never seen one that high in the wild, although I’m sure they’re out there. So it certainly might be worth doing–but not necessarily, particularly if you have reason to believe the stock you’re buying on the cheap will pay decent dividends or increase in value. It’s a tasty lunch, but it’s not really the proverbial free one. Okay, so if you sell immediately after vesting, your tax rate on the money you make on the ESPP shares is either taxed at the short-term capital gains rate, or as regular income — a rate which is the same or lower for most people. And again, once you’ve maxxed out your 401(k) and Roth IRA, what is the investment which can 1) beat a guaranteed 15% (or more) gain but is taxed at the short-term capital gains rate or the regular income rate or 2) is guaranteed a lower percentage gain but will come out ahead of a taxed 15% once you account for that? I literally cannot think of anything like this. If participating and immediately selling upon vesting in an ESPP plan as being “healthy except for the broken leg”, then as far as I can tell, there is no investment at all, except for maybe short-term government-secured money market funds, which anyone should put their money into. My comments were predicated on the assumption that Alex M had enough liquid funds in case of short-term disaster — I’ll also note that some credit card APRs might be bad enough that you would want to pay down those debts first (which would also help one’s credit rating). But as far as opportunity cost goes, 1) the whole point of the 3″x5″ index card is to come up with straightforward investment rules and 2) if opportunities to make returns greater than 15% every 3 or 6 months come up often enough that you need to keep every spare dollar handy, and none of those opportunities ever underperform the potential ESPP gain, let alone go bust on you, then you should not be working for any company that offers an ESPP plan; you should be a professional investor. The other end of this is that 15% is a VERY, VERY generous discount for any stock option that doesnâ€™t have a long vesting period. Iâ€™ve never seen one that high in the wild, although Iâ€™m sure theyâ€™re out there. Both my current company and my previous one had a 15% discount. The vesting periods were 3 months in both cases. Either I’m extremely lucky, or this is much more common than you seem to think. For younger people, you would have to take into account the outrageously huge student loans many of them have. I’m not sure if maximizing a 401k is a good idea when you’re paying 8%+ on a Grad Plus loan. So The Child wants to take 2 summer classes at the U of A. We say, okydoky, how much does that cost? She sez, they have scholarships, let me apply for them. So she does, and calls us up last week, hooray! I have $7000 extra in my UA bursers account! I’m like, wow! Well not so fast buster. We get a later call wherein The Child informs us that $5000 of that credit was a standard student loan. Without so much as consulting us, she said, NO! She had them remove the loan from the account. I admit I had to chuckle. But think how hard that loan would be to refuse if your parents were not quite so lucky. This is really awful stuff. The notion that the “Ownership Society” is anything other than a than an efficient path down the road to 20/30 years as a financial indentured servant is (and was) preposterous. Yeah, that’s tricky, balancing tax-deferred investment opportunities against known (and high) interest on debts. It’d depend on a bunch of factors, and for a lot of people, it’d probably be a wash. Probably the only really solid advice to someone in that situation is to spend as little as humanly possible on anything that’s not your 401(k)/Roth/etc. OR paying down your student loan/credit card/etc. debts. Getting to zero net worth is a major milestone! I’d add: try to avoid pre-committing more than half your income. If you lose your job, what expenses can you reduce or eliminate right away? I am not sure I agree with not buying specific equities. It is true that other market participants will certainly know more than you do, algorithmic trading is scary, etc. BUT that doesn’t mean an individual cannot have some insight into market dynamics without being a hedgie. I think it is probably fine to buy specific names so long as you restrict yourself to mega-caps with proven ability to generate cash (Chevron or Apple, not Facebook or Amazon), and so long as the portfolio is diversified and you hold for the long term, really the most they can do is game you a little bit on your entry and exit point. I see what you mean, but I think the spirit of the exercise is “what’s good advice for virtually anyone,” and while you’re correct that stock-picking for fun and profit is not impossible for amateurs, it’s not something I’d recommend for 90% of the public, either. The thing is, though, I think that the real value in stock-picking is for entertainment purposes, or to hone your sense of the world economic ocean in which your droplet of money is floating. Holding a few thousand dollars in a brokerage account may end up costing you as much as the fees on a mutual fund, and if your “insights” are about the general trend of the markets, or a good or bad feeling about a particular sector, well, they have funds for that. So I think it’s a fine thing to do with the money you’ve got lying around after you’ve established your long-term security, but I’d leave it off the index card. – life insurance. Term, obviously, but how much? – Disability insurance? Disability is far more common than death and people are underinsured for it. Maintain cash reserves for emergencies. Finance books recommend ~3 months expenses. How do you know the difference between an actively managed fund and a passive index fund? For example, even Vanguard funds have managers.